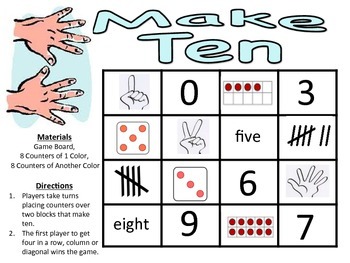 Make Ten is a 2-player game that allows students to practice making 10 using numbers, dice, tally marks, ten frames and/or words. Students take turns searching the game board and covering two blocks that make ten. The first player to connect four boxes in a row, column, or diagonal wins the game. This activity meets or exceeds the Common Core Standards of Mathematics and makes for a great class game or standards-based math center. * Make Five, Make Six, Make Seven, Make Eight, and Make Nine game boards also available in my store.